JOHANNESBURG (AP) — A key broker of the latest deal to end South Sudan’s civil war diverted European weapons to South Sudan’s military despite an EU arms embargo, a new report says. It also asks how a U.S. military jet ended up deployed in South Sudan in possible violation of arms export controls. The London-based Conflict Armament Research report , released on Thursday, raises questions about Uganda’s support for neighboring South Sudan’s government even as it promotes itself as a neutral negotiator in one of Africa’s deadliest conflicts. South Sudan’s warring sides signed the peace agreement in September to end a five-year civil war that has killed nearly 400,000 people. Previous deals have collapsed in gunfire. The new report is a “forensic picture of how prohibitions on arms transfers to the warring parties have failed,” said Conflict Armament Research’s executive director, James Bevan. The report says Uganda bought arms and ammunition from at least three EU members — Bulgaria, Romania and Slovakia — that were diverted to South Sudan’s military and armed allies in Sudan. The transfers occurred before the United Nations Security Council imposed its own arms embargo on South Sudan earlier this year but well after the EU embargo. With the Bulgarian weapons, “South Sudan arranged for Uganda to issue end-user certificates (the essential paperwork for an international arms transfer) … to make it look like these weapons were for the use of the Ugandan armed forces when in fact they were always destined for South Sudan,” said Mike Lewis, the head of regional operations for Conflict Armament Research. It is less clear whether Uganda’s government, a key U.S. security ally in the region, was complicit in the diversion of ammunition shipped to it from Romania and Slovakia in 2015, Lewis said. Some of the ammunition was discovered with Sudan-based militias allied with South Sudan’s military. Uganda’s government did not reply to evidence sent to it, Lewis said. Uganda’s military spokesman, Brig. Richard Karemire, told The Associated Press he had not seen the report. “For us, we support the peace process in South Sudan,” he said. As for the exporting countries, there is no suggestion they were complicit in, or even aware of, the diversion, the new report says. Uganda in the past has openly provided support to South Sudan’s government during the civil war, which erupted in late 2013 between supporters of President Salva Kiir and then-deputy Riek Machar. The latest peace deal once again returns Machar as Kiir’s deputy; a previous attempt at that arrangement failed amid fresh fighting in July 2016. The new deal, largely brokered by Uganda and Sudan, faces skepticism from the United States and others. Sudan in the past quietly supplied Chinese-made ammunition to South Sudan’s armed opposition, the new report adds. Chinese ammunition has made up 99 percent of the ammunition that Conflict Armament Research has documented in South Sudan since 2014. Based on interviews and commercial documents, the report found that the company, Yamasec, transferred both aircraft to South Sudan’s military. 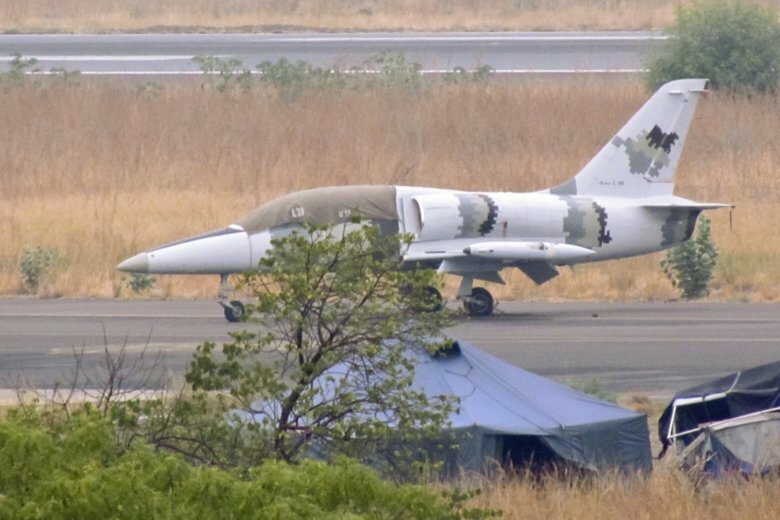 The U.S. military jet, after being used by Uganda’s air force, was deployed in South Sudan in 2016, overflying armed opposition targets along with attack helicopters. The military jet’s previous private owner in the U.S. told Conflict Armament Research that “Yamasec USA LLC took responsibility for obtaining a U.S. Department of Commerce dual-use export license,” the report says. “The Department of Commerce, however, has stated that it issued no such license” and it is not clear whether the State Department issued a required military export license. Yamasec did not reply to Conflict Armament Research, nor to the AP.